To praise the Lord and offer worshipful movement through dance which is a gift that comes from God. Attend rehearsals as set by the director. Most rehearsals will be two Fridays a month from 4:45pm-5:45pm, additional rehearsals may be scheduled before performances. Allowed 2 absences per semester, due to the limited amount of rehearsal time more absences than 2 may result in the dancer being put on probation until the following semester unless prior arrangements have been made with the director. 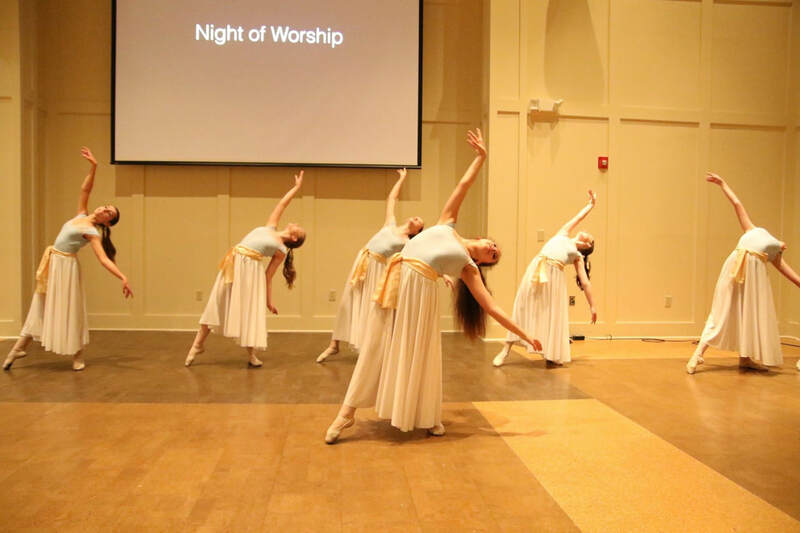 Approximately 1-2 performances a semester at a local church or other venue, each dancer must perform in a minimum of 1 performance per semester. Each dancer needs to purchase a leotard for performances. The dancer must also wear their company tights and presentable ballet shoes (no holes). A skirt and headpiece will be provided for the dancer to use. Willingness to learn several pieces of choreography and retain knowledge of repertoire including different parts in the same piece. Commitment to the group and director to be an involved and reliable dancer. Flexibility with choreography as parts may change due to different dancers performing for each performance and flexibility with adapting choreography to different size and shape performance spaces. Love of dance and desire to share the love of God and his grace through dance.